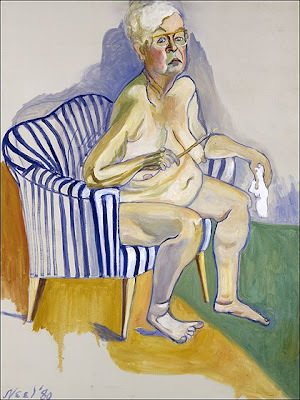 I've only for a few weeks been smitten by the work of the painter Alice Neel. I've heard the name. I've walked by the real Alice Neels in various museums and kept on walking. I wanted to get to the O'Keefes and the Monets. I'm hitting my forehead asking myself why hadn't I looked at them? Here I am, typing away after having looked at several online images of Alice Neel portraits (and a still-life or two)that I started saving in January. She's really amazing. 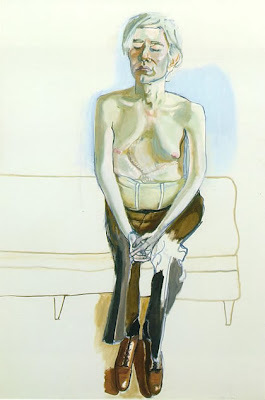 Once one looks at the first Alice Neel painting (the first one really seen), every other encounter with one of her other images is familiar - 'oh, that's Alice Neel'. Perhaps I didn't stop because it's a little hard to look at some of the portraits. Neel's self-portrait and the Andy Warhol painting in particular, are really personal. We're not used to seeing an old woman's body or the massive scar on a pop icon's torso as a result of the bullet from the gun of a crazed fan. Andy Warhol was a massive artist/celebrity but that's exactly what rendered him velnerable to an attack on his life. His expression in Neel's painting is all at once private and public. I don't think I've ever seen a single photograph or self-portrait of Warhol that captures him quite as well. Alice Neel was an unflinchingly honest portraitist. Though she was part of notable artistic and intellectual circles, she never sought to glamorize her subjects, prefering to paint honestly their bodies, both young and old, beautiful and plain. In her lifetime, Neel painted the portraits of poets Frank O'Hara and Allen Ginsberg, potician Bella Abzug, performance artist Annie Sprinkle and artist Faith Ringgold, among many others. Can't say I share your feeling about this particular artist. But I guess that's why they make both chocolate and vanilla ice cream. if you are that interested. Hope you enjoy them. Thank you for the introduction to Alice Neel. What an incredible, in my opinion, artist. Her faces are mesmerizing as are her angles.